Standalone HTML website: A zip file containing a website with your portfolio data is created. You cannot import this into Mahara or another portfolio system again, but it is readable in a standard web browser and you do not need a Mahara in order to view it. To view this website, extract the zip file and click on the index.html file that is in the folder. It is recommended that you export your portfolio both in HTML and Leap2A because you never know whether you will be able to import it back into Mahara or maybe even another ePortfolio system. Choose either Standalone HTML website or Leap2A. You can run through the export twice in order to get both formats. All my data: Everything that is stored in your account in Content and Portfolio. Excluded are any of your group contributions. Just some of my pages: You can choose which pages and the artefacts that are contained within them you want to export. Just some of my collections: You can select which collections and the artefacts that are contained within them you want to export. Your pages and collections are listed alphabetically. If you have chosen to export just some pages or collections, you can select them here by ticking the individual checkboxes to mark them for inclusion. Use the buttons Select all or Reverse selection to quickly choose the portfolio pages or collections to include in your export. Click the Click to preview link to preview a page before you select it. You cannot yet preview collections. 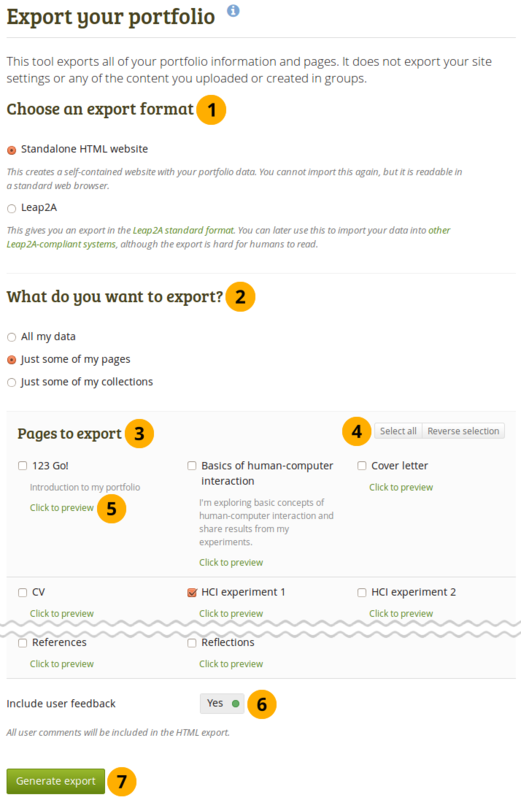 When you selected the HTML export, you can choose to Include user feedback if you want to keep that in your export. In order to do so, set the switch to “Yes”. This option is only available when you choose the HTML website export. When you choose the Leap2A export, your feedback is always included. Click the Generate export button to start the export process. Depending on the size of your portfolio, the export may take a little bit. Once everything has been processed, a file will either be downloaded automatically to your computer or you can decide to save it. That depends on your browser settings. If your export gets stuck in the process and the progress bar does not move along at all, your server settings may prevent long operations to avoid slowing down the entire system. You will need to contact your site administrator, e.g. via the “Contact us” form in the footer of the page. Experimental feature: If your site administrator enabled the feature to queue Leap2A exports, you will receive a notification when the export has finished. You then have 24 hours until the link to the archive expires. If you do not download your export within that time frame, you will need to export your content again.